Taken with Olympus E500 digital camera April 29th 2008. Click image for larger view. At this time of the year we get to see some amazing sunsets here in Northern Norway. During the spring, before we get midnight sun, the sun is setting in the ocean in the horizon. In this picture I have zoomed in on the sun when it was about to set in the ocean. There was some mist in the horizon and it made the sun look particularly spectacular with different shades of red. We’ve had sunsets like this for a week now and the weather have been great with record warmth. 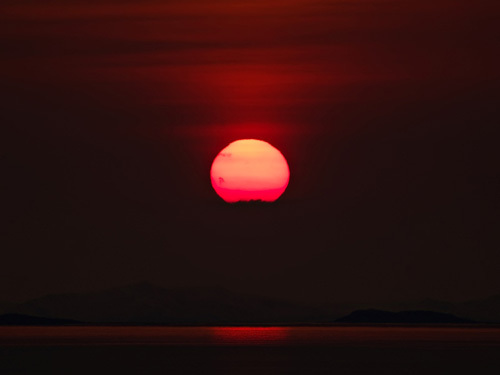 Check out this photo from last year of the sun disappearing in the ocean. How amazing! Almost looks pinkish. I’m sure that it’s exploded in green growth up there right now. I remember taking a 3-4 day series shot over a weekend when I saw the trees sprouting. At the end of May I believe it was. It went from winter to spring in a couple of days. Fantastic. It doesn’t matter how blue I get, I can always come here to feel better. You are so awesome! Thank you! That looks absolutely amazing! You’re lucky to see this, and I’m glad you’re sharing it with us. Amazing sunset photograph. Just saw a Vimeo’s video that made me remember your blog. Lovely photo of a magical sunset. What a gift for you to see and for those you share it with too!